Ice Candles are amazing to look at and even more fun to make. You actually pour hot wax right over ice cubes! 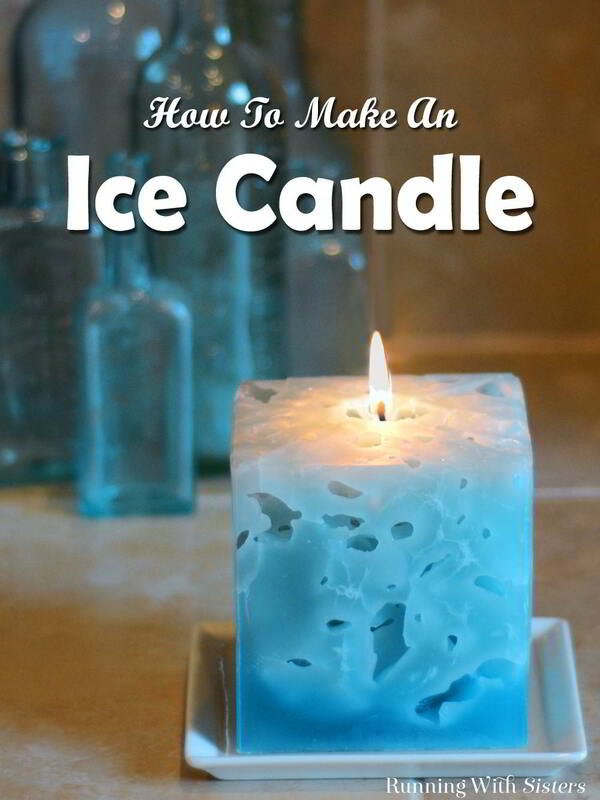 The ice melts away and leaves nooks and crannies inside the candle. 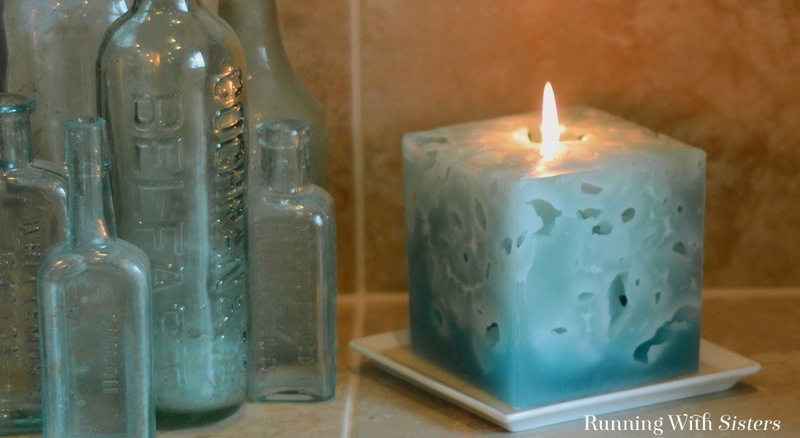 This candle is one of ten candle lessons we have in our Handmade Candle Course on Curious.com! 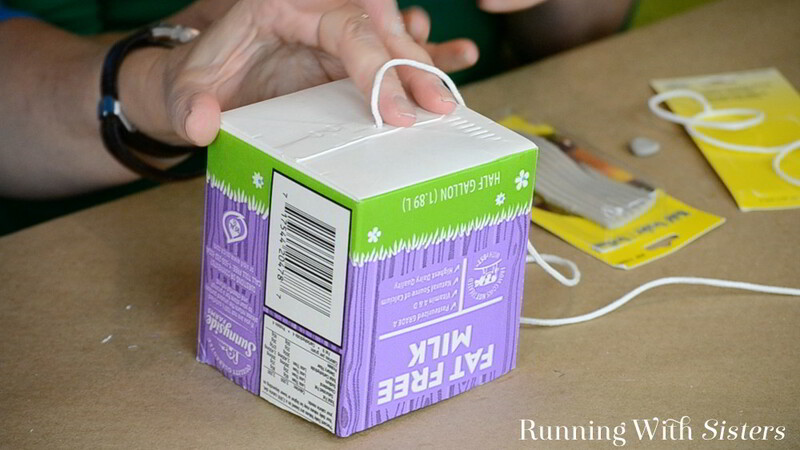 Follow the steps below or watch us make the candle step-by-step on Curious. For this candle we used a recycled milk carton for a candle mold. 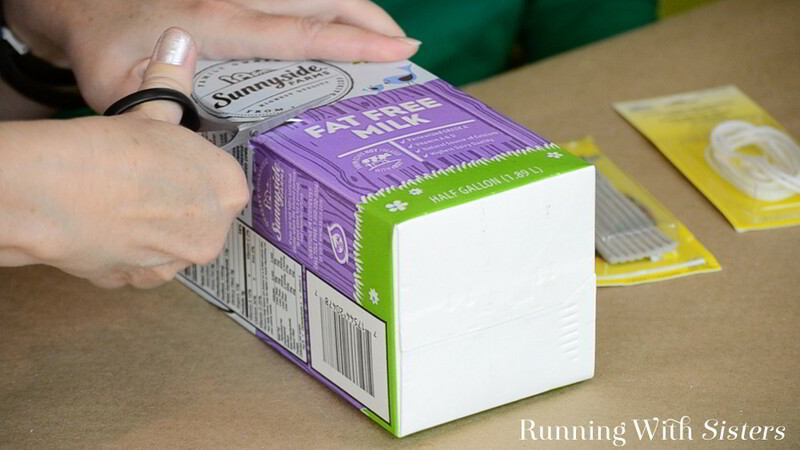 Cut the top off the milk carton to make the mold five inches high. 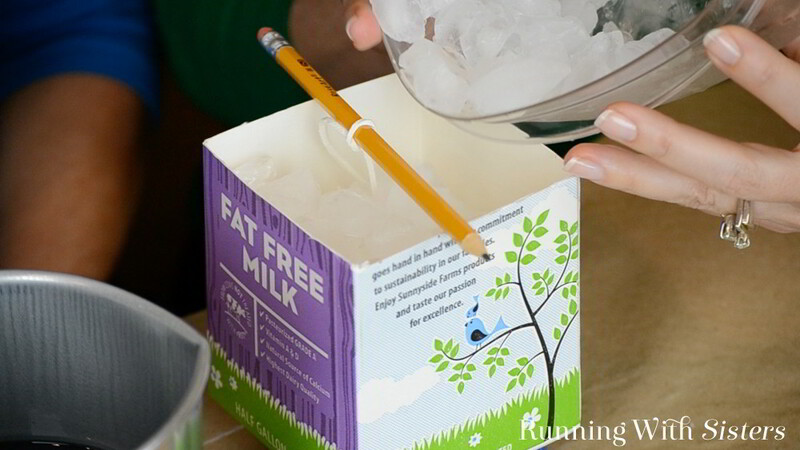 Make a hole in the bottom of carton with the awl. Feed the wicking through the hole at bottom of mold leaving about one inch of wick sticking out of the bottom. Tie the other end of the wick to a pencil and prop it across the top of the mold. Now is a good time to prepare your work space, too. We like to cover a cookie sheet with aluminum foil and do all our hot wax pouring over it. That way, if our mold springs a leak or we spill any wax, it stays contained. 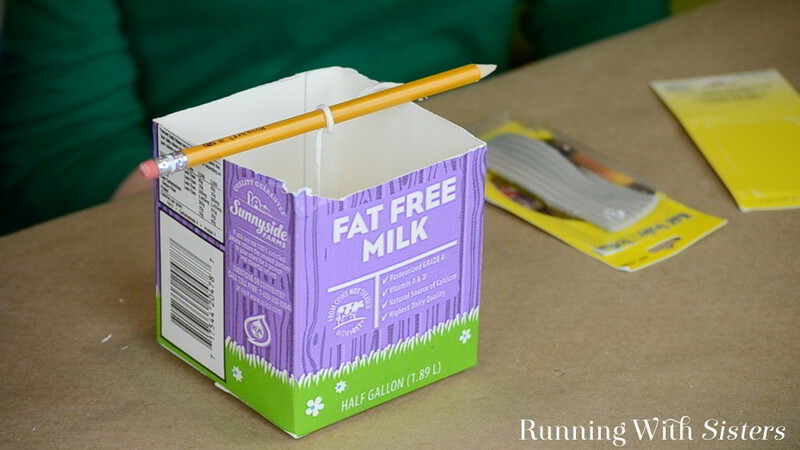 Take the volume of milk carton and divide it by two (because we are only using the bottom half of the carton). The milk carton holds 32 ounces and half of that is 16 ounces. We will use a mix of ice and wax so we will need about a half of that amount or 8 ounces. 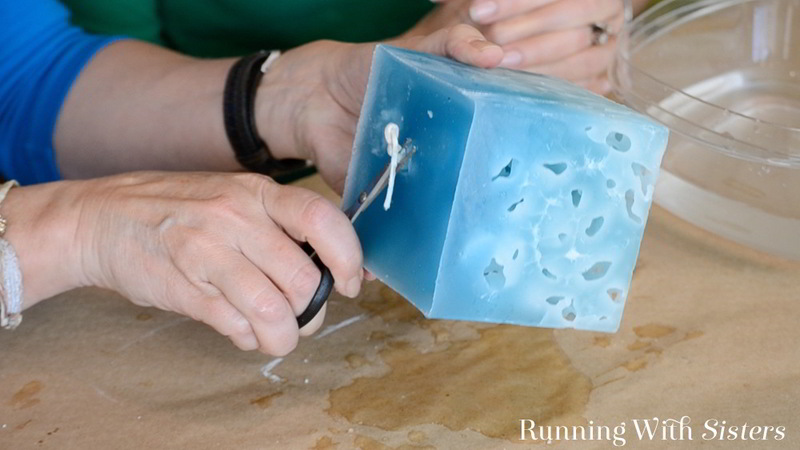 Cut the wax into small chunks using the hammer, chisel, and cutting board. Weigh out 8 ounces of wax then add 2 ounces for spillage. 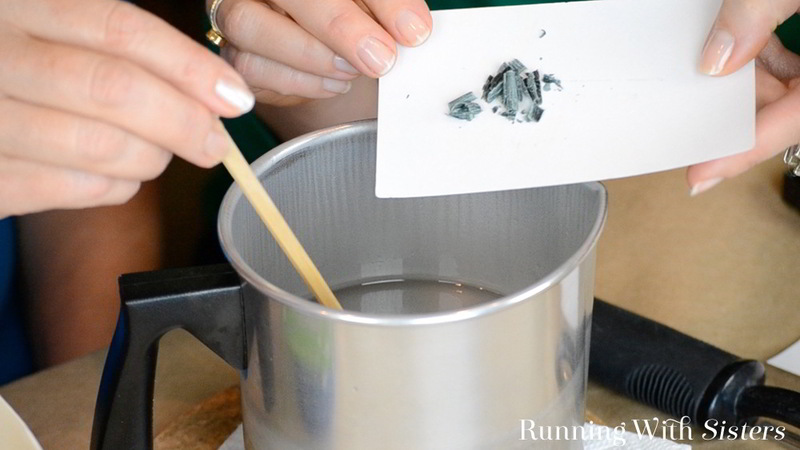 Heat the wax on a double boiler to 200-210°F. Shave a few carrot curls of color off the dye block using the potato peeler. (We think it’s funny that we call the tool a potato peeler, but we always refer to the shavings it makes as carrot curls.) Add the shavings to the melted wax and stir. Test the color by dripping a few drops onto an index card. Add more color if desired. Drop ice cubes into the wicked mold. 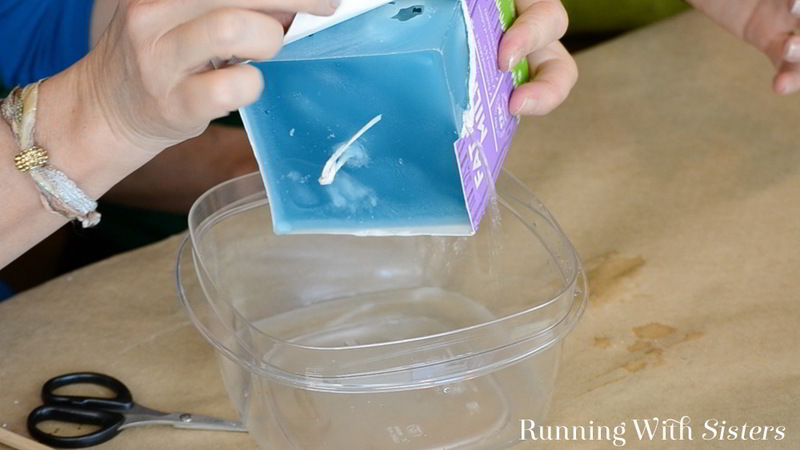 Pour the hot wax into the mold right over the ice cubes. Make sure the wick is centered. Let the candle cool completely, about 1 to 2 hours. 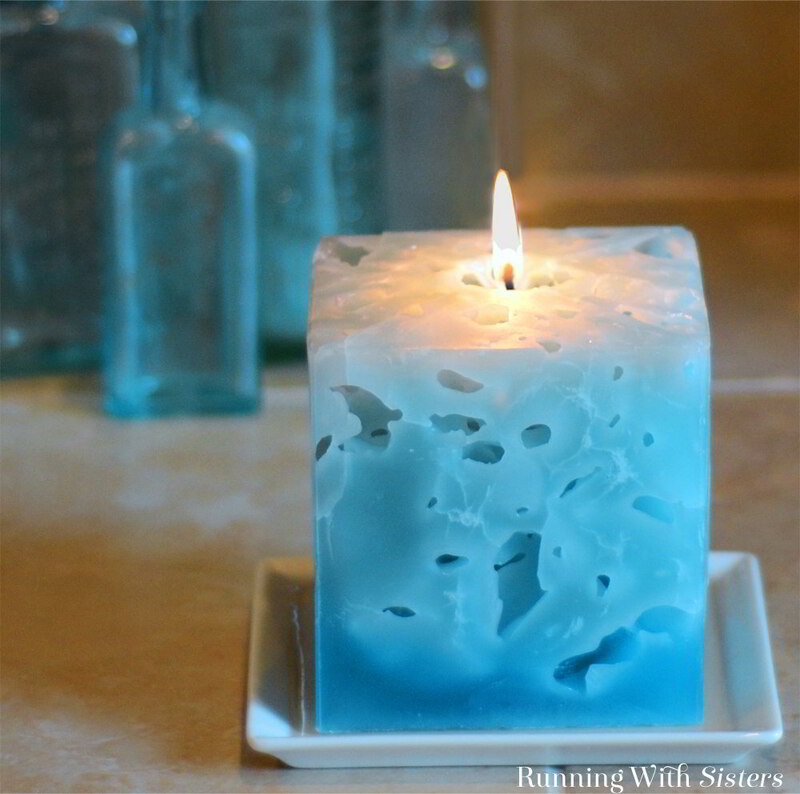 (This candle cools a lot faster than regular candles since the ice does so much cooling!) 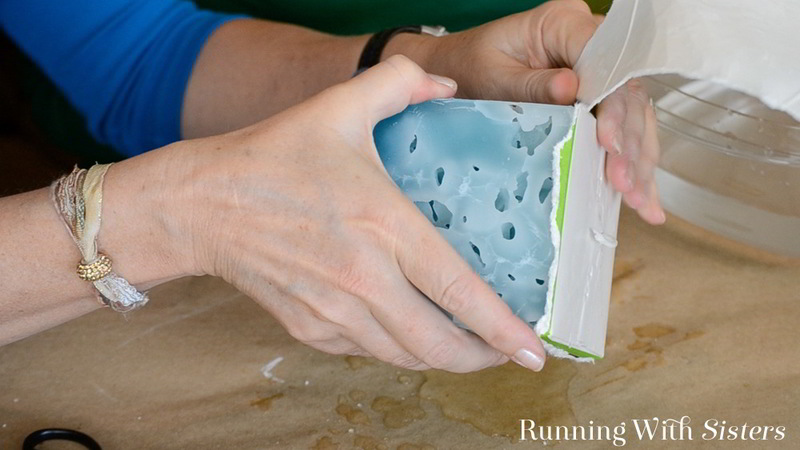 Remove the mold sealer from the bottom of the carton. 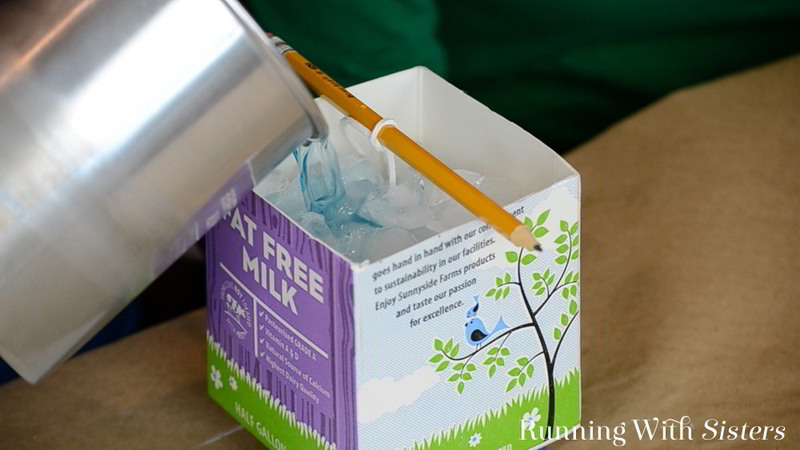 Peel the carton away over a bowl or sink and pour off the water. Turn the candle over – the bottom is the top! Trim the candlewick to 1/4”. Trim the wick that is now on the bottom of the candle flush. Let the candle dry out completely before burning. Isn’t this a fun project? Let us know if you make it! And if you have any questions, just leave us a comment. We are here to help! Hi, I’m new to candle making (as in I have watched like 3 videos about it and haven’t made one myself yet) and was just wondering what a mold sealer is? And where I could find one? Mold sealer is a gray putty/clay that comes in a coil. 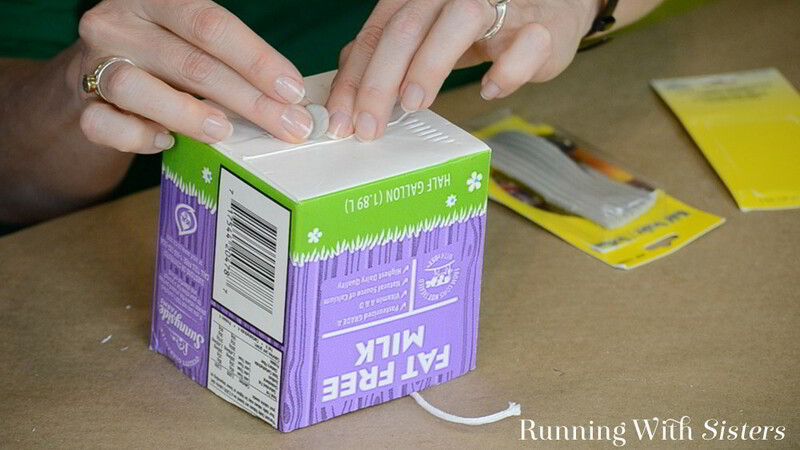 You squish it over the opening in the bottom of the mold where you pull the wick through. It keeps the melted wax from seeping out through that hole. Here is what it looks like: https://www.amazon.com/Yaley-Enterprises-Candle-Crafting-Sealer/dp/B000YQGFE0/ref=sr_1_1?ie=UTF8&qid=1472581290&sr=8-1&keywords=candle+mold+sealer (And that is also the brand we use). Hope that helps! And remember we are here if you have any other questions. We love to help! Would this work for soy? Great question! Soy Wax should work fine! 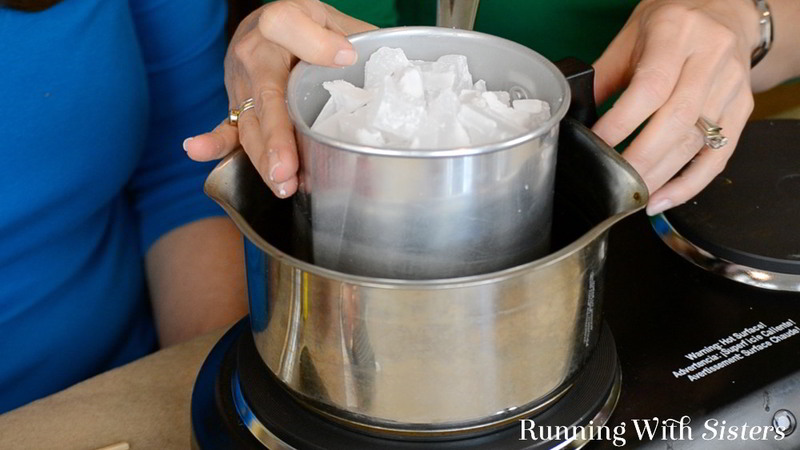 Did you use whole ice cubes or crushed ice? Great question! We used whole cubes. I remember making these as a kid with my mom. Can’t wait to make with my grandkids (ages 14 and 18). ?